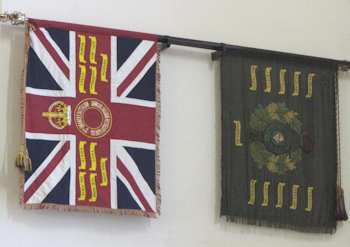 Historically, special banners called “Colours” have been awarded to infantry units. Colours are in two forms. The Sovereign’s Colour is based on the Union Flag and denotes loyalty to the sovereign. It is known as the Queen’s or the King’s Colour. The Regimental Colour marks loyalty to the Regiment. In times past they were regarded as a rallying point or safe haven in battle. Traditionally, when the time came through aging or other reasons that the Colour could no longer be held by the regiment, it was laid to rest in the "village church" of the regiment as a reminder of the local people who had served. The Colours are rectangular in shape. Because of the strong Scottish heritage of the 27th Infantry Battalion (The South Australian Scottish Regiment), the old Colours were laid up in Scots Church Adelaide on 22nd of November 1964. These Colours provided a history of three South Australian Infantry units. Embroidered on each Colour is the name, badge and motto of the Regiment or Battalion together with the names and dates of battles for which the unit was awarded a Battle Honour for distinguished service. These provide an historical record of the places where the unit has served and played a significant part in the particular battle. For both World Wars, units of the 27th Battalion Australian Imperial Forces (AIF) were raised for overseas service, and disbanded after the conflict. The honours and traditions of these units were transferred to the 27th Battalion (South Australian Scottish Regiment). These units received both a Sovereign's colour and a Regimental colour. The original Sovereign’s Colour had been presented to the Regiment in 1920 to honour service in World War 1, and the Regimental colour was provided a little later with money raised by public appeal. In August 1983 the Queen’s Colour was stolen from the church and in spite of diligent efforts by the church, the police and the Regimental Associations, this act of criminal vandalism has remained unsolved. The theft has been described as a loss to South Australia of a significant part of our military history and the record of the endurance and sacrifice of the men who had served our country under the Colours. During worship on Sunday 11th November 2012, a replica of The Queen’s Colour was received at Scots Church Adelaide, donated by Mrs Junlee Wheaton in memory of her husband Lieutenant Colonel Ivan Gratton Wheaton OAM RFD ED. The plaque records the details. In addition the Colour carries the Honorary Distinction South Africa 1899-1902 which was borne for the South Australian Infantry Regiment. This unit was formed in 1938 as a Militia Battalion. Members wore the Seaforth Mackenzie tartan and were affiliated with the Seaforth Highlanders, a historic regiment of the British Army associated with the Highlands of Scotland. At the outbreak of World War 2 they provided protective duties in South Australia. Two days after Japan entered the war in 1941 the 27th was mobilized and sent to Darwin where they established a number of defensive positions and were in action during the bombing of Darwin in 1942. In 1943 they were sent to the Atherton Tableland for jungle training before being sent to the Solomon Islands and Bougainville where they filled a series of defensive, surveillance and patrolling combat roles. In 1944 the unit was redesignated as the 27th Australian Infantry Battalion (AIF). By the end of the war they had lost 22 dead and 54 wounded. For their service they were awarded the Battle Honour Liberation of Australian New Guinea.